And so begins the first of Tim Egan’s dozen picture books, to which he has recently added the Dodsworth easy reader series — three so far, each of which co-stars that crazy duck! 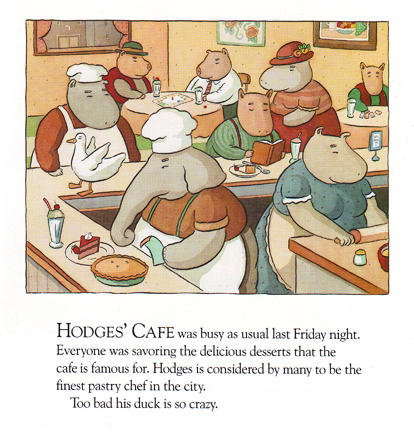 Most of his characters are anthropomorphic animals — cows, pigs, dogs, etc. who walk upright, wear clothes, speak in complete sentences. Egan likes to have a little fun blurring the categories between people and animals. 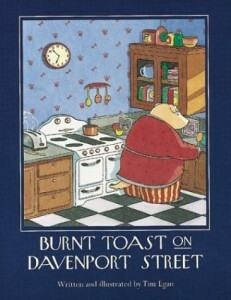 The dog protagonists — Arthur and Stella Crandall — of Burnt Toast on Davenport Street (1997) dress well, and live in a beautifully furnished house. They behave like humans. Yet, beneath an illustration of Stella sitting on the couch and Arthur adjusting the TV set’s antenna, Egan writes, “Arthur and Stella were happy dogs. They lived at 623 Davenport Street and had lived there for many years. They spent their days doing what most dogs do. Eating, walking, and sleeping.” Near the end of the book, when the Crandalls are happy, “They both smiled and wagged their tails.” Egan slyly reminds us that, though they dress and act like people, they retain their doggy natures. Each of Egan’s stories feels both slightly familiar and completely original. On the familiar side, the picture books of both Marshall and William Steig come to mind — animal characters with distinct personalities, the suggestion of a moral. And on the original side, there’s the unlikely premise of each story. 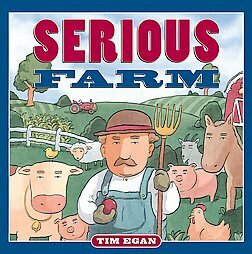 In Serious Farm (2003), Farmer Fred (a human character!) seems to lack a sense of humor. The animals try to make him laugh. The plot complication in Chestnut Cove begins with a watermelon competition sponsored by King Milford. In The Pink Refrigerator (2007), Dodsworth’s motto is “Try to do as little as possible”… until he meets a pink fridge that starts to give him ideas. Where does Egan get his ideas? He told Contemporary Authors, “My writing process consists of sitting in an overstuffed chair and staring at a notebook, hoping something will happen. When it doesn’t, I get more coffee. 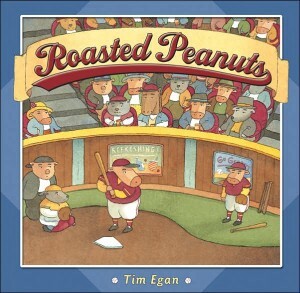 When it does, I write.”1 Next time you’re looking for a good story to go with your coffee, why not pick up some Tim Egan books? You’ll find them on the shelves by the overstuffed chair, right next to the watermelons. 1. “Tim Egan.” Contemporary Authors Online. Detroit: Gale, 2006. Literature Resource Center. Web. 3 Aug. 2010. Soooo funny. I just discovered your blog, couldn’t get “too bad his duck is so crazy” out of my head, got the book at the library yesterday and since then the phrase has been handy for filling lulls in conversation — well, at least when I’m chatting with my six year old. Haven’t tried it out with grown-ups yet. Anyway, thanks for the tip and we’ll be heading to the E’s for Egan on our weekly library trips from now on. Thanks, Robbie! I’ll need to devote some future blog posts to the books of other children’s authors I find amusing — Mark Newgarden, Lane Smith, Laurie Keller, to name a few. In the meantime, keep an eye out for those crazy ducks.